The Mac can self-report some battery information, and Coconut Battery is pretty slick, too. But for someone handy with the command line, it turns out there’s a wealth of information about your battery and charger status. I was kind of surprised to find that TextMate (at least TextMate 2) doesn’t allow you to edit keyboard shortcuts. I found myself repeatedly trying to use the next- and previous-tab shortcuts I use in Chrome while in TextMate, which… didn’t work. A “good” user would probably learn the right shortcuts, but I wanted the software to change, not my brain. I found most of the solution on Jason Seifer’s blog (thanks!). 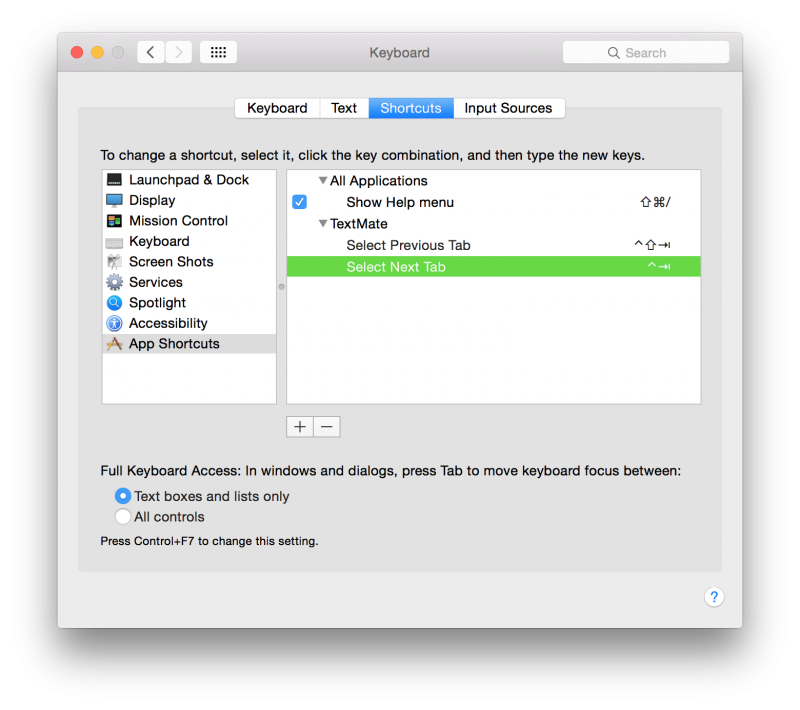 I never realized you can set application-specific keyboard shortcuts in OS X, and that’s exactly what I needed. Unfortunately, since his post (or maybe between TextMate and TextMate 2), the menu text has changed. And now, viola! Ctrl+Tab advances to the next tab, and Ctrl+Shift+Tab goes to the previous tab—just like in my web browser!